Red Card ? No, no, this game is Virtua Striker ! 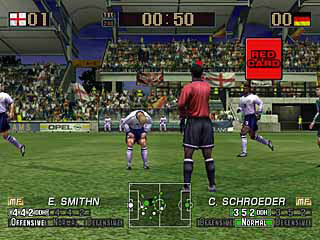 "The hottest soccer series in arcade history comes home to the Nintendo GameCube in Virtua Striker 2002 by Amusement Vision. 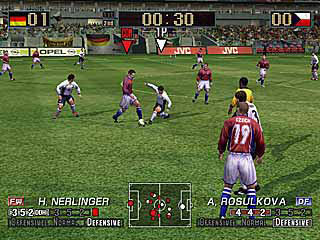 Virtua Striker 2002 has been designed exclusively for the GameCube, and features 10 unique modes packed with all-new simulation elements. 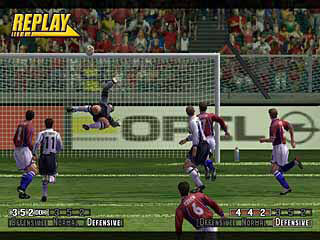 Choose one of 64 national teams, set up your rosters and formations, and hit the field running. Want even more control? Flex your coaching skills and train your players in a four-year quest for the ultimate glory -- the International Cup. And of course, the trademark fast-and-furious Virtua Striker gameplay is back and better than ever. 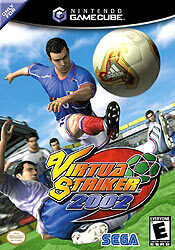 Score a copy of Virtua Striker 2002 and you'll agree -- the world's most popular game has never been better." "- Developed exclusively for Nintendo GameCube. - Play with 64 unique national teams in 10 different game modes. - Fast arcade gameplay combined with new simulation elements. - Road to International Cup mode lets you train a team from upstart rookies to world-tested champions. - Hone your skills in the Training mode, which presents different challenges over multiple levels of difficulty. - League, Tournament, and Ranking modes test your abilities against the world's bestteams. - Design your superstar from the ground up in Edit mode. - Save your highlight-worthy goals for posterity on a Memory Card."